At one time, the henequen trade made Mérida, the capital of the Yucatán, one of the richest cities in the world. Today, its lovely white stuccoed buildings remind us of its opulent past. A horse and carriage ride down the Paseo Montejo will help you understand why Mérida was once known as "The Paris of Mexico." 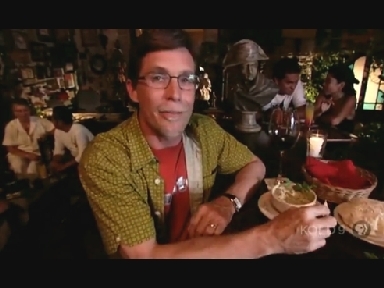 Rick Bayless takes us on a journey through the Mérida market stalls for a look at the blending of Mayan traditions with the Spanish influences. Dishes such as Ha Si Lil Pac, a pumpkinseed dip with habañero is totally Mayan, yet still part of Mérida’s meals today. The market’s meat stalls jump-start Rick’s surprising roller coaster ride through Mérida’s food history from Pork Picadillo to the baroque Queso Relleño (stuffed cheese) found in all the classic Yucatán restaurants. Along the way, we explore the Lebanese influence on this colonial city where thousands of locals dance in the town square nearly every night of the week.